#ARC – The 26th Atlantic Rally for Sailing Cruisers (ARC) finished in fine style on Saturday 17 December with a spectacular prize giving ceremony at the Gaiety Nightclub in Gros Islet, Saint Lucia. 2011 was a vintage ARC, with most boats experiencing fast crossing times - the ARC crossing record almost tumbled after standing unchallenged since 2006. After a downwind start in perfect conditions in Las Palmas de Gran Canaria, the 217 yachts, including a record-breaking 31 multihulls, headed south and then west across the Atlantic towards Rodney Bay, Saint Lucia. Classic trade wind conditions provided exciting downwind sailing, with the Franco-Russian team on super-maxi Med Spirit finishing in 11 days and 14 hours; only 9 hours outside the ARC crossing record set by Capricorno (ITA) in 2006. Following Med Spirit over the line was trimaran Rayon Vert (FRA), Gunboat 66 Phaedo (USA), ex-Whitbread maxi Rothmans (SWE) then Open 40 Vaquita (AUT) - these five boats finishing within 13 days and almost 3 days ahead of the next bunch of finishers. Most of the fleet experienced a 'wind hole' as they closed Saint Lucia, leaving some boats becalmed and chasing the lightest of breezes or resorting to the motor. Line honours prizes for boats crossing the line first in their division without motoring were awarded to Med Spirit (FRA), Rayon Vert (FRA), Vaquita (AUT), Hassebas (NED) and Dantés (GER). The overall Cruising Division prize for calculated results was awarded to Standfast 56 Splendid (NED) skippered by Kees-Jan Baartmans, and vintage Oyster Lightwave 48 Scarlet Oyster (GBR) skippered by Ross Applebey, won the RORC Racing Division. While the fastest finishers are always newsworthy, most of the ARC fleet are family cruisers. The contributions made by a wide range of sailors are recognised during the prize giving, with special awards including the Spirit of the ARC Award. This was awarded to Stuart Letton and the crew of Time Bandit (GBR) for their enthusiasm for ARC activities and involvement in all aspects of the rally. Christof Petter and the crew of Vaquita (AUT) won the Eric Jean Trophy for their work in raising awareness for the Whale and Dolphin Conservation Society. There were awards for the youngest skipper, 24 year old Lucy Reynolds on Northern Child (GBR) and the oldest skipper, 78 year old Juan Egido from Peru on Nandina. The youngest sailor was 5 year old Aksel Skogseth Berg on Perle (NOR). The most beautiful yacht was voted to be bright orange Gunboat 66 Phaedo (USA) and the prize for oldest was won by 75 year old Cruinneag III (GBR). The Philip Hitchcock Award for safety was won by Hunny Pot (GBR) for impressing the safety equipment inspectors in Las Palmas. There were awards for the blogs submitted to the ARC website while the boats were at sea, with 108 boats submitting blogs in 9 different languages; awards for fishing prowess; and prizes for the best wall paintings made in Las Palmas. Of the 217 boats that set off from Las Palmas de Gran Canaria on 20 November, 215 crossed the Atlantic successfully (two retired to the Canaries) and 214 crossed the finish line in Rodney Bay, Saint Lucia. Damages were limited to blown sails, a few broken booms and two broken forestays, but all of the damaged boats were able to finish. The organisers and participants were deeply saddened to learn on 8 December of the sudden death from suspected heart attack of Andrew Nash, who was sailing on Ocean Wanderer. #CRUISING–The Cruising Association, Britain's organisation for cruising sailors, is opening its doors to non-members in January for a guide to sailing the many stunning destinations in the Bay of Biscay. The CA says the area has an unfair reputation for rough seas and although it can be testing, with careful planning and sensible precautions, there are some truly stunning and uncrowded destinations awaiting discovery. Judith Grimwade, Secretary of the CA's Biscay section says "Mention Biscay to most sailors and they start to twitch, but from the rivers north of the Loire to the Spanish Rias there are some amazing destinations which are generally much less busy than some of the over-crowded channel ports and harbours. Our members have cruised these waters for years and know the secrets of what to do and what to avoid. They have amassed a wealth of practical and in-depth knowledge of the area and they'll be sharing this with non-members as well as members at this special Biscay Day." The day includes illustrated talks by CA experts and will cover the route options of crossing from France to Spain including tips on how to make the journey by coastal hopping. There's a comprehensive guide to the Spanish Rias, the sheltered and amazingly attractive inlets on Spain's north-west coast. There's also a guide to the sheltered and attractive rivers north of the Loire and a practical step-by-step guide to the French Atlantic coast. The CA's Specialist Biscay Day will be held at the CA's headquarters in Limehouse Basin, 1 Northey Street, London, E14 8BT on January 15th and starts at 12 noon. The cost, £27 for members and £35 for non-members, includes a hot buffet 2 course supper. Places are limited and will be allocated on a first-come first-served basis. The Cruising Association, Britain's leading organisation for cruising sailors, is to launch a new specialist section for those who cruise Northern France and the Channel Islands. The new section will be launched at the association's headquarters, CA House, in London's Limehouse on Sunday October 30th. and covers the French coast from Dunkerque in the east to Portsall in the west, including the Channel Islands. The inaugural meeting is open to non-members as well as members and will include talks by experts on crossing the Channel, sailing the Brittany coast and the Channel Islands. Judith Grimwade, the CA's Chair of Sections Group says, "There are thousands of people who cruise the waters of Northern France and the Channel Islands, or would like to, and this new section has been designed for them. Not only does it provide a one-stop-shop for up-to-date information on sailing in the area but also there are experts on hand to give advice on everything from where to moor to which restaurants serve the best Moules Frites. Section members also benefit from discounts on products and services as well as the invaluable local knowledge provided by our team of Honorary Local Representatives (HLRs). A programme of events is in preparation." Forty cruising boats will sail up the river Liffey to spend a night near the the replica famine ship Jeanie Johnston. The East Link bridge will lift and the Samuel Beckett bridge will swing open at noon on Saturday 24 September. The boats are mostly modest sailing yachts with some motor cruisers, typically eight to twelve metres long with up to six people aboard. They come from ports on the East coast of Ireland between Arklow and Skerries. The sailors will spend the afternoon visiting other boats, renewing friendships and comparing notes. Some will use the opportunity to explore the city centre from this unusual perspective. There are organised visits to the Jeanie Johnston and the Guinness Storehouse. A special attraction this year is a guided tour of the docks in an inflatable boat, by Sea Safari. In the evening the whole group, about a hundred people, will gather for dinner in a nearby hotel. Formalities will be limited to a review of the season in general and the summer cruise in Strangford Lough, but the party is likely to continue until late. Most sailors will spend the night aboard their boats. On Sunday morning commodore Derek Harris will say mass aboard the Jeanie Johnston. The bridges will open once more at noon, and the fleet will disperse to their home ports. This annual event is organised by the Cruising Association of Ireland with the co-operation of the Dublin Docklands Development Authority and Dublin Corporation. Ireland's largest cruiser hire company is set to move into waterways north of the border next year. 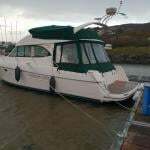 Carrickcraft – which for 30 years has provided cruising holidays on the Shannon and the Erne - has plans to operate a small fleet of hire-boats on the Lower Bann in 2012. The company will initially operate three Kilkenny Class cruisers (2 + 4 berth) and three Carlow Class cruisers (2 + 2 berth) from new pontoons at Coleraine Town Centre Marina. According to Carrickcraft, a seven-day holiday on the Bann would allow travellers to see all of the river and have some extra time to discover the hinterland. Carrickcraft MD John Morton said: “We are delighted to be able to open a fourth Irish base and to bring more tourists to the region. We are fully committed to the project and hope to increase the fleet size in the future. The first boats will arrive early in the New Year ahead of the summer season from March to October 2012. For booking enquiries contact the sales office at 028 3834 4993. For more details visit www.cruise-ireland.com. Watersports holidays at home make the perfect family getaway, according to The Irish Times. The paper recently rounded up some of the best spots for making a splash with the kids – such as surfing, diving and cliff jumping in Donegal, and sailing and cruising in Kinsale - and all at prices that won't push the budget. The Cruising Association of Ireland holds its first meet this year on May 7 at the National Yacht Club in Dun Laoghaire. The hope is to follow on the success of last September's River Liffey Cruise where 40 boats participated, meeting for Dinner and drinks. Dinner will be served at 8pm at a reduced cost of only €20 per person, Drinks in the bar, wine available @ €18 per bottle. The is rally open to all cruising sailors, and there will be a brief presentation of the Strangford Lough cruise in late July. The Cruising Association AGM will be held in a private room from 1900 – 1930 for CAI members interested in attending. Every year, at the Cruising Association's London headquarters in Limehouse, it holds a one-day seminar for those planning to cruise in the Mediterranean. Open to both members and non-members, this year's event was a sell-out with more than 90 cruising sailors taking part. To cater for the growing demand for this type of event, the Med Section is considering running two seminars a year, with a second at another venue, in late autumn. Eco-friendly cruising: avoiding anchoring damage, reducing and recycling waste, minimising harm from grey and black water discharges, which paints and cleaners to use on hulls and decks, and preventing pollution from engines. Albania: a new cruising destination; ports of entry, paperwork, personal security, chart accuracy, safe anchorages, restricted areas, marinas – few and small at the moment. Healthcare: insurance, the European healthcare scheme, prescription and over-the-counter drugs, European names for UK drugs, first-aid box contents, on-board injuries, gastric problems, sunburn, dehydration, heat stroke, insects, jelly fish, and more. Weather: typical weather patterns, national forecasts, internet forecasts, different weather models, GRIBs, Navtex, how to interpret and evaluate forecasts, forecasting from your own observations. Regulations: boat papers, radio licences, insurance, crew lists, passports and visas, International Certificate of Competence, CEVNI, VAT, pollution control, residency, personal taxation. 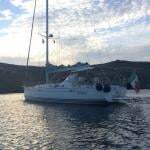 Fitting-out: awnings and biminis, drinking water, swimming, scuba and snorkels, gas, refrigeration, wind and solar generation, anchoring – rodes, scope and anchor types, bow-to and stern-to mooring, tenders, passerelles, tools and spares. At the end of the day, delegates were asked to suggest their own tactics and techniques to improve Mediterranean cruising. Many of these involved alcohol, but the prize for the best suggestion was to anchor from the stern, to encourage airflow through the boat. Each year, the Med Section publishes a summary of members' cruising plans to make it easier for members to arrange to meet up during the summer. The Section is organising a rally on the island of Uglyan in Croatia in June this year, and a rally in the Peloponnese is planned for 2012. Membership of the Med Section is free to any member of the Cruising Association.